PUKALANI — It took every single one of the 15 sets it played in three nights, but the Maui High School boys volleyball team is headed back to the state tournament for the first time since 2013. 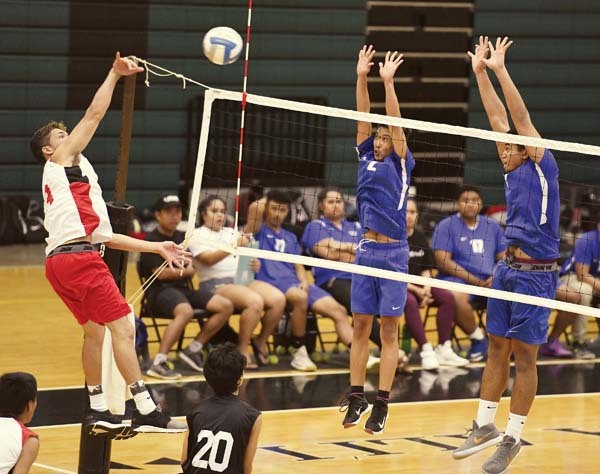 After winning a five-setter on Monday and losing another on Tuesday, the Sabers dug deep for a 25-21, 25-14, 19-25, 16-25, 15-8 win over Lahainaluna in a second-place playoff game for the Maui Interscholastic League’s final state berth on Wednesday night at King Kekaulike Gym. Higashiguchi admitted he and his teammates were tired. They will now host a state tournament first-round match on Monday — the brackets are expected to be announced today. 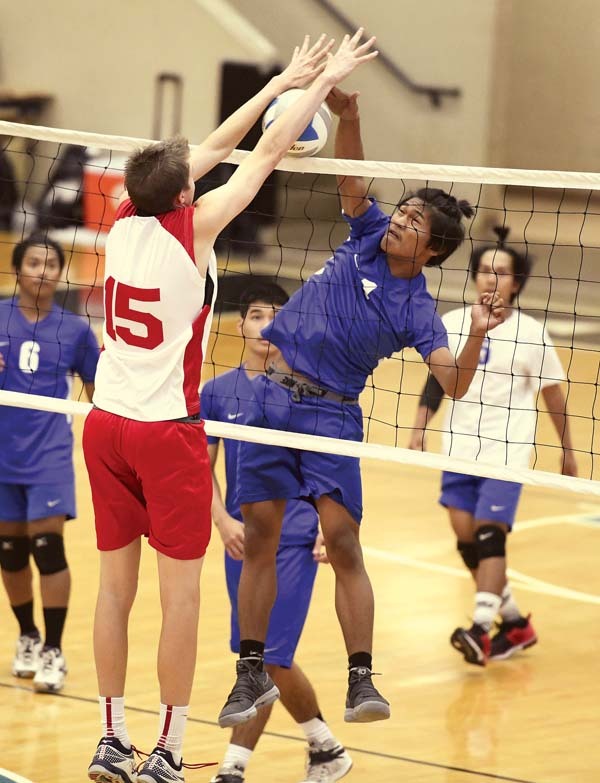 Jon Aunese smacked 18 kills and Denniel Carreon dished out 44 assists for Maui High (8-7). The Lunas’ season ends at 9-5 after five-set losses to the Sabers on Monday and Wednesday. Elijah Oliveira led the Lunas with 19 kills, Carter Stockham added 14 kills and Matt Jess Domingo had 12 digs for the Lunas. Maui High broke away from a 3-3 tie in the fifth set by scoring five straight points, a run capped by a dink by Aunese. The Lunas would not get closer than four the rest of the way. A double block by Aunese and Rexie Butihi ended the match and brought a sigh of relief from Maui High coach Kenny Houpo. The Sabers bounced out to a 10-2 lead in the first set before the Lunas rallied to tie it at 19. Back-to-back kills by Higashiguchi gave the Sabers a 21-19 lead, and a kill by Aunese made it 24-20. In the second set, Maui High built a 9-3 lead. It was 13-7 after a Higashiguchi kill, and an ace by Carreon made it 15-9. Julius Benavidez’s kill pushed the lead to 20-12, and an ace by Trent Takara made it 22-12. Aunese’s kill ended the set. The Lunas took their first lead of the match at 6-5 in the third set on a kill by Oliveira and upped the advantage to 8-5, prompting a timeout from Houpo. A kill by Stockham pushed the lead to 15-8 and brought another timeout from Maui High. The Sabers ripped off four straight points to climb within 17-13, but they would not get any closer. A kill by Oliveira ended the set. It was the Lunas who started quickly in the fourth set, jumping out to a 9-2 lead. Maui High ran off a 4-0 run to get within 10-7 — a Stockham kill stopped the run momentarily before the Sabers ran off three more points to climb within 11-10. Oliveira then had three straight kills in a 9-0 Lunas run, and a Stockham kill ended the frame and set up the final drama.